Former U.S. President Barack Obama, right, speaks during the 2018 Nelson Mandela Annual Lecture at the Wanderers cricket stadium in Johannesburg, July 17, 2018. 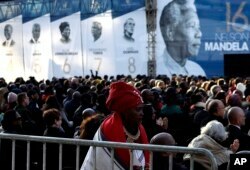 South Africans engaged in charity events Wednesday to mark the 100th anniversary of the birth of Nelson Mandela, the nation's first black president. Barack Obama, the first black U.S. president, met in Johannesburg with young leaders from across Africa to mark the occasion. A day earlier, Obama delivered what might have been the strongest statements of his post-presidential life. In his speech Tuesday for this year's annual Nelson Mandela memorial lecture, Obama sketched a rosy picture of the progress and equality brought about by progressive leaders like the late Mandela, then contrasted that with what he called today's "strange and uncertain" politics. "I am not being alarmist, I am simply stating the facts," he said. "Look around. Strongman politics are ascendant suddenly, whereby elections and some pretense of democracy are maintained — the form of it — but those in power seek to undermine every institution or norm that gives democracy meaning. In the West, you've got far-right parties that oftentimes are based not just on platforms of protectionism and closed borders, but also on barely hidden racial nationalism." Members of the public sit beneath a banner of former President Nelson Mandela, where former U.S. President Barack Obama delivered his speech at the 16th Annual Nelson Mandela Lecture at the Wanderers Stadium in Johannesburg, South Africa, July 17, 2018. 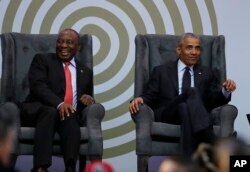 John Stremlau, a professor of international relations at the University of the Witwatersrand in South Africa, said Obama described an attractive alternative to the spread of right-wing politics. "I thought it was offering all of us a progressive alternative to the strongman, autocratic tendencies that are showing themselves in too many countries of the world, including the United States," Stremlau told VOA. "And for Barack Obama to embrace Mandela a day after Trump embraced Putin in Helsinki drew a very stark contrast, even though it was implicit," he added, referring to the summit this week in Finland's capital between U.S. President Donald Trump and Russian President Vladimir Putin. While Trump's name did not come up in the 90-minute speech, Obama delivered plenty of backhands clearly aimed at Trump. "Unfortunately, too much of politics today seems to reject the very concept of objective truth," Obama said. "People just make stuff up. … We see the utter loss of shame among political leaders where they're caught in a lie and they just double down and they lie some more. Look, politicians have always lied, but it used to be if you caught them lying they'd be like, 'Oh, man.' Now they just keep on lying." He added, "Don't you get a sense sometimes — again, I'm ad-libbing here — that these people who are so intent on putting people down and puffing themselves up that they're small-hearted, that there's something they're just afraid of?" Politically, Stremlau says, Obama bolstered two very different movements. He praised new South African President Cyril Ramaphosa, who took over after increasingly unpopular President Jacob Zuma resigned in February. South African President Cyril Ramaphosa, left, and former U.S. President Barack Obama share a light moment at the 16th Annual Nelson Mandela Lecture at the Wanderers Stadium in Johannesburg, South Africa, July 17, 2018. And, Stremlau says, he laid out a roadmap for his own Democratic Party, which is trying to win back a congressional majority in midterm elections later this year. "I think its real significance is that what Obama was doing was outlining a strategy for the Democrats for the '18 congressional elections coming up," he said. "He's been relatively quiet, as you know, since he left the White House. This was his first major public address, and I like the idea that he gave such a substantive rationale for an approach to politics that is progressive but also intelligent and faithful to Mandela, but he could also circulate that speech to all in the Democratic Party, and as he campaigns for candidates, which I gather he's going to do in the fall, then he will be able to link that to the ideas and the ideals that he articulated in the Wanderers Stadium on July 17 in South Africa." For all of his warnings, Obama urged those listening to hold on to hope. "So, young people who are in the audience, who are listening, my message to you is simple, keep believing, keep marching, keep building, keep raising your voice," he said. "Every generation has the opportunity to remake the world." And as if in reply, the crowd of 15,000 people who gathered in the cricket stadium in the bitter winter cold responded with a chant: "Yes, we can."